Looking for a way to engage your students in multiplication? 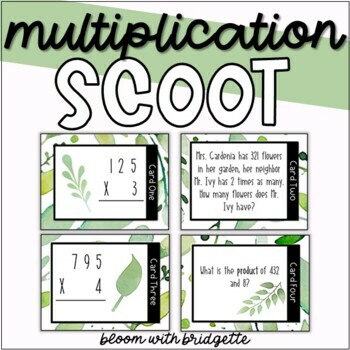 This spring themed multiplication scoot will get your students moving around the room, discussing math with each other, and practicing multiplication. Use these fresh cards as a scavenger hunt, scoot around the classroom, or as station task cards. Included in this product are 28 multiplication cards, a key, and two different student recording sheets. This multiplication scoot is aligned with the third grade common core standards. • Click the green star to get email notifications about new resources and sales.